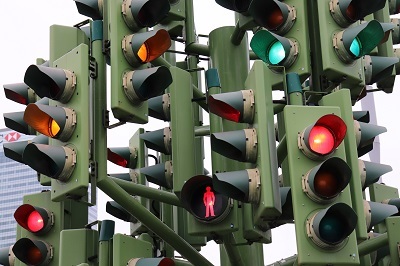 One of the most unusual sculptures in London is located on a traffic roundabout near Billingsgate Market, close to the Canary Wharf Financial District. 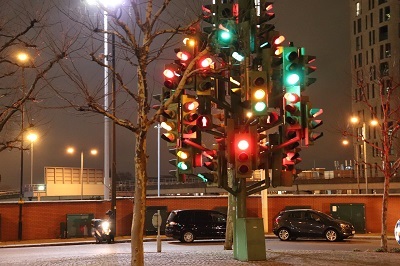 The public sculpture entitled Traffic Light Tree was created by the French sculptor Pierre Vivant following a competition run by the Public Art Commissions Agency. 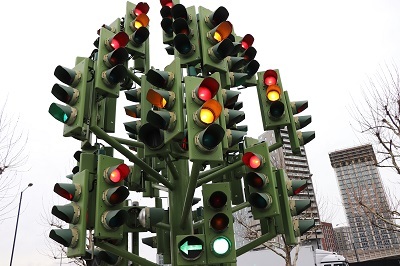 The sculpture is eight metres tall and contains 75 sets of lights, each controlled by computer. Vivant was inspired to create the sculpture by London Plane Trees and the changing pattern of the lights reflects the never-ending rhythm of the surrounding domestic, financial and commercial activities. 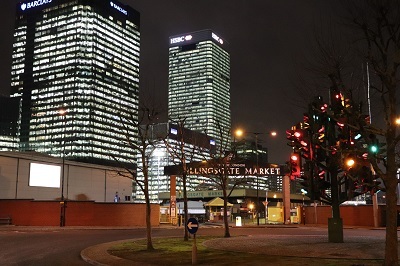 The sculpture was originally located on a roundabout in Millwall, at the junction of Heron Quay, Marsh Wall and Westferry Road. 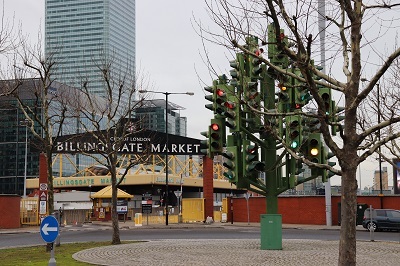 It was installed in 1998 and soon became a favourite with tourists and locals, however due to redevelopment in 2011 the sculpture was moved to a new location opposite Billingsgate Market where it had an official lighting-up ceremony in 2014. 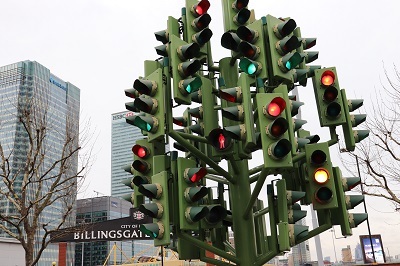 It is still known to confuse motorists but that is all part of the fun about having a Traffic Light Tree. The sculpture was the reason the roundabout it stood on was voted the best UK roundabout in 2005. By londonvisitors2014 in London Sculptures on January 17, 2019 .